Tuesday | December 6, 2016	With the recent major refurbish to the outlet, it now looks indeed more spacious and cosier. Even the menu underwent nips and tucks to include steaks, more seafood selection and a myriad of light bites over beer and wine. Must Try >> Bakerzin Ribeye Steak Sourced from Australia and grass fed for 300 days, our premium Ribeye Steak is selected from a range of finest pasture-fed steaks, cooked to your liking! Grilled to perfection, baked potato with sour cream and bacon bits, and served with sautéed vegetables (topped with choice of pepper sauce, mushroom sauce or butter) You may top up additional sides for sautéed mushrooms, sautéed spinach or Corn on cob at $4. Must Try >> Beer Battered Classic Fish N Chips Beer battered leatherjacket fillet, deep fried to a golden brown. Served with mixed garden greens and Asian tartar sauce. One of the most well-loved main courses of all time, Fish n Chips, has been the top choice for all diners. To continue to serve this dish differently from others, Bakerzin’s very own chef uses top grade fresh leatherjacket fillet compared to the dory or barramundi fillet, where the meat is not as succulent and flavorful. The marination is important, where he then marinates the fillet in beer batter and other spices to give the crisp layer of the fillet an oomph when its deep fried. This is a definite must-try! No meal is complete without a dessert from Bakerzin! Bakerzin, a fine purveyor of sweet treats, has a masterful creation up its sleeves. Apart from the Signature Strawberry Shortcake, one of the more zesty fruity flavour is our Rainbow Cake. Made with layers of different fruit flavors for each sponge, this is one of its kind. Light, fluffy and addictive will have you wanting more. 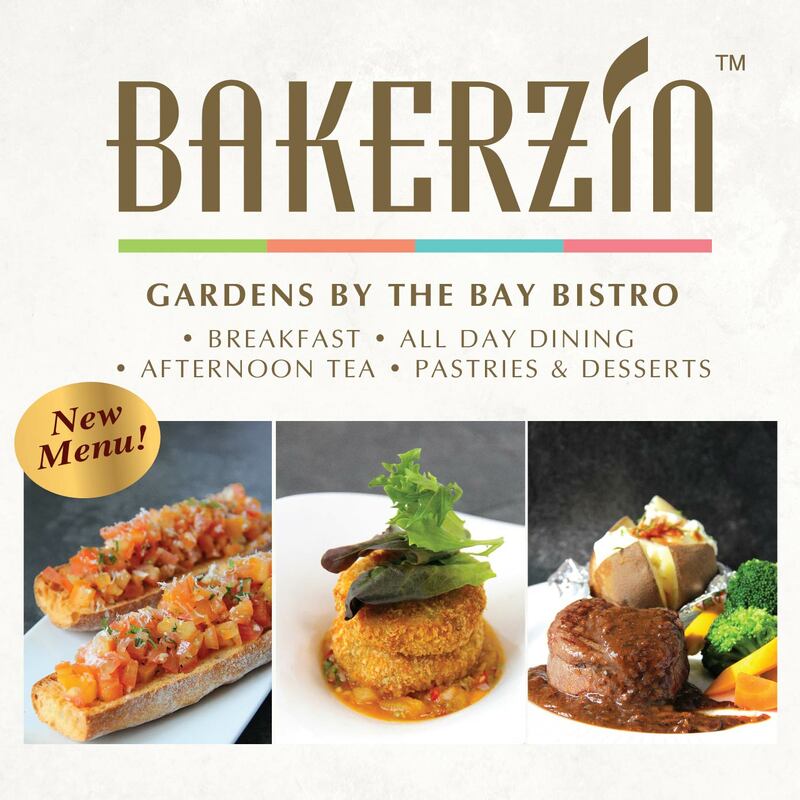 Wait no further, visit Gardens by the Bay Bistro at 18 Marina Garden Drive #03-03 today!